Many of Wednesday's newspaper focus on Theresa May's efforts to extend the Brexit process. The Times suggests the EU will warn that the price of a delay could be a general election or another referendum. 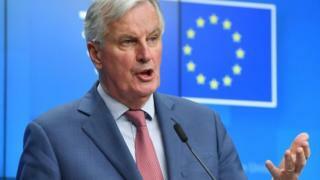 The Independent website refers to "the Barnier ultimatum", after the EU's chief Brexit negotiator, Michel Barnier, said there would need to be a "new event or new political process" to secure an extension. Meanwhile, the front page of the Daily Telegraph quotes the Commons leader Andrea Leadsom who was said to have told a stormy meeting of the cabinet yesterday: "This used to be the cabinet that would deliver Brexit - from what I'm hearing it's not". The paper claims that if a new date for leaving has not been agreed by Monday, the government will activate its doomsday planning for a worst-case no-deal scenario known as "Operation Yellowhammer". A number of papers are especially scathing in their criticism of what they call the political establishment. The Daily Mail says "incompetent MPs and hard Brexit zealots" have made Britain a laughing stock, resulting in 1,000 wasted days since the vote in 2016. According to the Sun, this is the last chance for a generation of "feeble" politicians to do their duty to democracy. Meanwhile, the Guardian reports on protests by climate change campaigners, after Britain's first new deep coal mine in 30 years was given the green light by local authorities in Cumbria. The undersea mine will reportedly employ 500 people, and another 2,000 more along the supply chain. Councillors tell the Guardian that while they would prefer to reduce reliance on fossil fuels, the steel industry's need for coking coal and the number of jobs on offer outweighed those concerns. Meanwhile, claims of a postcode lottery for routine NHS procedures elicit a strong reaction from the Daily Express. New research reportedly shows that more than half of England's 195 Clinical Commissioning Groups limit cataract operations. There is reported to be similar rationing for knee and hip replacements. The paper's leader column says these procedures are essential for people who experience terrible discomfort, and concludes there is little excuse for rationing treatment in parts of the country. A spokesman for NHS Clinical Commissioners speaks of "tough choices" in the face of spiralling demand and financial pressures. The Daily Mirror reports there's been a surge in the number of British people who've signed up for assisted dying centres in Switzerland where campaigners estimate that someone from the UK takes their own life every eight days. Numbers are said to have risen by more than 75% in the past four years. The Mirror says it's proof people are worried about how they might spend their final days, and calls for a "national conversation" about the pros and cons of assisted suicide. And the Daily Telegraph highlights an unfortunate man who changed his name to Michael Jackson, but now can't afford the deed poll fee to revert it back. John Michael Jackson, from Malvern in the West Midlands, admits he used to "blindly follow" the singer, but changed his mind in the wake of renewed allegations. He tells the Telegraph that he is now struggling with background checks as he tries to break into the care profession.